s held to felicitate the winners at JW Marriott, Mumbai on March 26, 2019. The participants were awarded for having performed exceptionally well in Business Competitions throughout last year i.e. in AY 2018-19. According to Shoumik, he had the following achievements due to which he was nominated and finally won the award. National finalist in SAIL & NHRDN’s Anubhav National Management Competition. Campus winner in Bajaj Off-road Admasters Campus Challenge. ‘I was the only one to have achieved this feat in the 1st year of MBA itself. The remaining 29 were in their 2nd year of MBA’, says Shoumik. 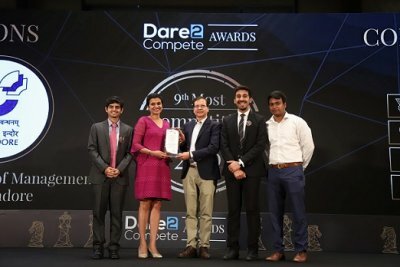 He also mentioned that IIM Indore was also chosen among the Top 10 Competitive B Schools of India—and received the award from Ms. Meghna Apparao, Director, Amazon. 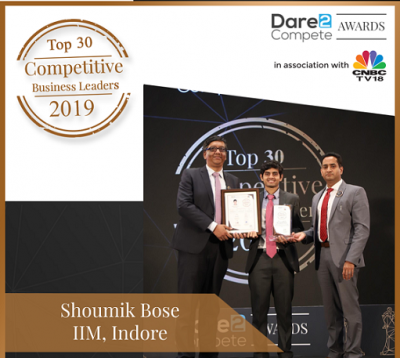 IIM Indore congratulates Shoumik for his achievement.